Howard Schultz announced he was leaving Starbucks less than a week after the chain closed down stores for racial-bias training. Here's what it could mean for his rumoured political aspirations. StarbucksHoward Schultz is leaving Starbucks. Howard Schultz is leaving Starbucks after more than three decades amid rumours of a potential presidential run. Starbucks has long combined business with social causes under Schultz’s leadership. Schultz’s plans to exit the company may have influenced how Starbucks responded to the arrests of two black men at a Philadelphia location in April. He had reportedly planned to leave the company for a year. Howard Schultz is out at Starbucks. As rumours swirl regarding Schultz’s political aspirations, the chairman’s last few years at Starbucks can be seen in a different light. Can Schultz’s aggressive approach to social justice be separated from rumours he is thinking about launching his political career? Schultz has long argued that business and social issues can go hand in hand. Since President Donald Trump’s rise to political power, Starbucks and Schultz have become more outspoken on certain social issues. In September 2016, Schultz endorsed Hillary Clinton for president – his first time publicly endorsing a candidate. That December, he announced plans to step down as CEO, saying he would instead be focusing on Starbucks’ “social missions” as chairman. In January 2017, he blasted Trump’s attempt to bar refugees from entering the United States, inspiring boycott threats from the right. In August 2017, after white supremacists rallied in Charlottesville, Virginia, he wrote a piece in the Financial Times about national identity. However, the most high-profile statement on social issues that Starbucks has made is likely its most recent one. 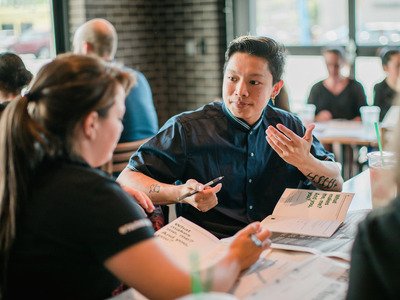 StarbucksStarbucks employees at anti-bias training in May. In April, footage of two black men being arrested at a Philadelphia location of the coffee chain went viral. Employees called the police when the men refused to leave the Starbucks after asking to use the restroom without having purchased any drinks. The incident sparked a national conversation about how people of colour – specifically black people – are treated at restaurants and retailers. And, while other incidents made headlines in the following weeks, no company reacted with such intensity as Starbucks. Starbucks announced plans to close its more than 8,000 locations in the United States for the afternoon of May 29 to “conduct racial-bias education geared toward preventing discrimination in our stores.” The chain also did something unheard of in the restaurant industry with a new policy that allows people to hang out in stores and use the bathrooms without making any purchases. While various Starbucks executives were involved in developing the response to the arrests, Schultz was front and center in Starbucks’ grappling with its role in the arrests. But he and the rest of Starbucks’ board also had something else going on behind the scenes: his plan to retire. The executive chairman broke the news that he was leaving Starbucks less than a week after the coffee giant closed all of its locations for racial-bias training. Schultz had privately shared plans to retire with the Starbucks board about a year beforehand, the executive chairman told The New York Times. According to Schultz, he had planned to announced his departure last month, but pushed back the event after the arrests in Philadelphia. 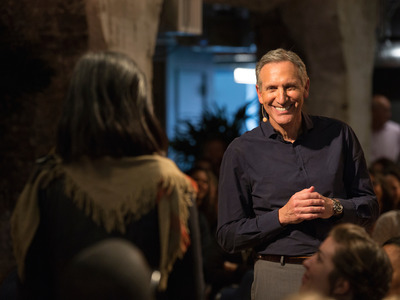 That means, as news of the arrests broke and backlash grew, Schultz was forced to deal with the issue not only in terms of how it would impact Starbucks, but also how it would colour his legacy at the chain as he exited. In the past, some Starbucks employees have complained that Schultz’s reactions to American tragedies have been influenced by his own political aspirations. “Howard Schultz is using these events to practice for his presidential run,” one Starbucks worker said in an email to Business Insider in 2017 after Schultz held a company town hall to address white supremacy following violence in Charlottesville. Starbucks’ decision to go all-in on tackling the topic of how racism impacts the chain is an admirable one in many ways. Closing stores for training was simply good business for the progressive chain, which found success the last time it shuttered locations to address fundamental issues. However, changing policies – such as the open bathroom law – also raises concerns about whether Starbucks is losing some of its core advantages by overcorrecting. “We have a long-term commitment to making our stores even more welcoming and safe for all, and Kevin and his leadership team plan to continue championing that work well after Howard’s departure as chairman,” a Starbucks spokesperson said in an email to Business Insider. With rumours that Schultz is considering running for office, it’s worth asking how much the executive chairman’s own future played into the aftermath of Starbucks’ latest scandal.